A 2-0 win against Barbados on Sunday 2nd March and a 5-0 win against St Lucia on Wednesday 5th leaves Jamaica in impressive shape as they end their two-match Caribbean tour on a high. These two international friendless were arranged with the specific aim of preparing the team for the forthcoming Caribbean Cup tournament and Jamaica can take a lot out of them. There’s no hiding the fact Jamaica were tipped to claim wins in both of these games, largely because of the opposition they faced in the shape of Barbados and St Lucia – two sides which still have a lot of work to do in order to be highly ranked within the Caribbean region. But Winfried Schäfer’s men had to be thorough, professional and avoid complacency. And they did just that, notching up seven goals and conceded a grand zero. This presented the perfect opportunity for Schäfer – who had been visiting local domestic matches to monitor players before the two fixtures – to experiment with some inexperienced home-based individuals such as Harbour View’s Kemar Lawrence, Portmore United’s Ricardo Morris and Arnett Gardens’ Renae Lloyd. The German coach has harped on about giving young homegrown players a go since he was appointed last year, insisting there must be an effective blend with squad members based in Europe. The rookie newcomers didn’t disappoint, especially 21-year-old defender Lawrence who made one of Deshorn Brown’s two goals in the victory over Barbados. Goalkeeper Andre Blake – a recent mover to Philadelphia Union in the MLS via the SuperDraft – was handed a start in goal for that game and he kept a clean sheet, further boosting his already respectable reputation. Highly rated 19-year-old central defender Alvas Powell produced an assured performance, the overseas-based players made an impact and all-in-all it was a satisfying evening, on what was a difficult pitch. But the star man was Brown, contracted to the Colorado Rapids in the MLS, as he completed a double and was a handful throughout. He only made his debut in October last year but he’s adjusted to international football seamlessly and at 23, he has ample time to keep on scoring in a Jamaican jersey. 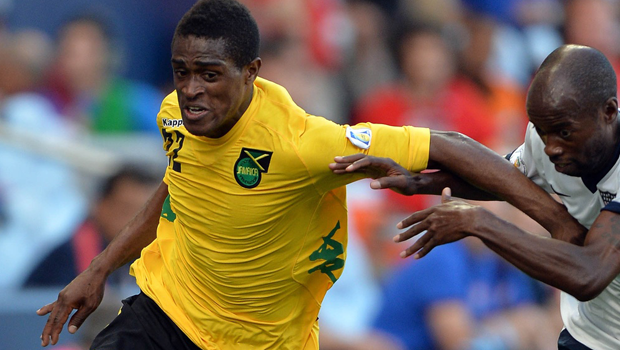 Against St Lucia, the pitch was better and it enabled Jamaica to keep the ball on the deck. Schäfer likes his teams to press high up the pitch and almost suffocate the opposition; Jamaica closed down St Lucia effectively and they excelled in every department. It was a night which saw a lot of the Jamaican players catch the eye as striker Darren Mattocks got two, prodigious forward Michael Seaton, 17, scored his first international goal, Garath McCleary converted his first goal for the side, and Brown grabbed the other one. British-based Adrian Mariappa and Wes Morgan started in central defence, Leeds United’s Rodolph Austin anchored the midfield while McCleary was positioned out wide to provide Mattocks and Seaton with the crosses. The team had a good mix of age, experience and techniques. Jamaica didn’t give St Lucia a fighting chance. They harassed, hurried and chased everything down. They were smart in possession, exploited the space and showed why they will be such a force to be reckoned with at the Caribbean Cup. “These wins are important,” said Schäfer after the match. “It’s our first step on the road.” And by that he means not only the Caribbean Cup but the 2018 World Cup. Jamaica already have their sights set on Russia in four years and the country’s federation has made big plans in order to try and get them there. Indeed, the federation’s President Captain Horace Burrell has weaved his magic and negotiated a number of excellent friendlies for the months ahead. Jamaica’s next scheduled friendly is against Serbia in late May before they travel to Lucerne to face Switzerland four days later. Then on 8 June The Reggae Boyz will lock horns with European heavyweights France in what promises to be a fantastic test for Schäfer and his men. The batch of friendlies ends in September against Canada in Toronto. So the schedule is considerably busier than usual but the country’s federation has done superbly well to organize these games against such illustrious opponents. These will be genuine tests of Jamaica’s capabilities. It is all well and good playing smaller nations like Barbados and St Lucia off the park but the likes of Switzerland and France are another ball game entirely. The audiences for these friendlies will be large and Jamaica will be exposed on the international stage. Schäfer would have by then had sufficient time to work out and formulate his best starting eleven and hopefully the team can start to gel and become familiar with each other heading into 2018. In World Cup qualifying there was a significant amount of chopping and changing and squad rotation due to injuries and suspensions. Now Jamaica needs a solid backbone; a consistency which will allow them to develop and thrive instead of stagnating. Or indeed going backwards. It has been a long time since the country’s last World Cup appearance in 1998 and the fans are yearning for qualification once again. 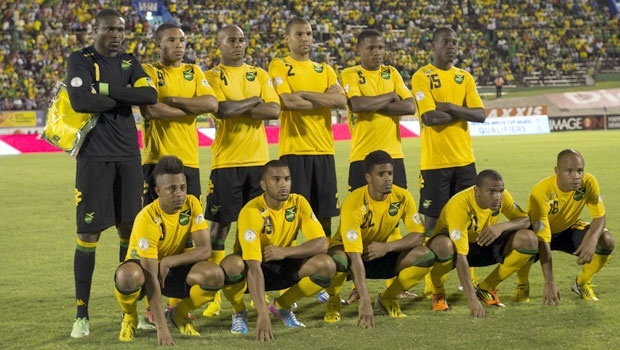 This is one of the best squads Jamaica has had in many years and the squad is young, fresh and hungry. In Schäfer the team has a very good coach whose attention to detail and hunger for success is there for everyone to see. He is working hard in tandem with Horace Burrell and the rest of the federation’s hierarchy to achieve great things again for Jamaica. There’s so much talent and it would be a great shame to see it go to waste and not be exhibited on the global stage. This entry was posted in Analysis and opinion and tagged Barbados, Deshorn Brown, garath mccleary, jamaica, Winfried Schäfer by The False Nine. Bookmark the permalink.